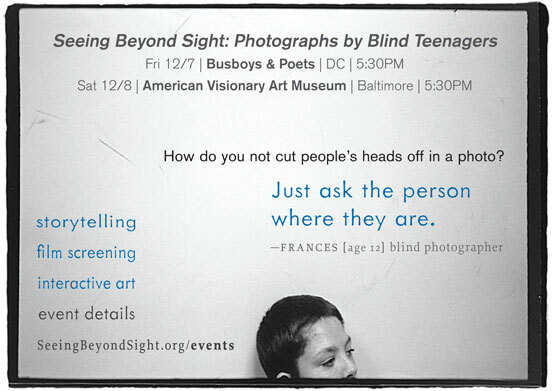 Tony Deifell will share images & stories from his new book SEEING BEYOND SIGHT about teaching photography to blind teenagers and how it challenged what he thought about art, vision & perception. View short scenes from an upcoming documentary film about the blind photographers in the book. Event is free and open to the public. Cash bar & restaurant. "This book will make you look—and look again—at how you perceive and what you assume." New York Times Book Review, Los Angeles Times and more recent press. Pat Aufderheide & Ann Williams (Center for Social Media at American University), Andy Carroll (American Poetry & Literacy Project), Leslie Crutchfield (Ashoka & co-author FORCES FOR GOOD), Alison Byrne Fields (Ogilvy Public Relations), Brian Gaines & Mora Segal (College Summit), Kristen Grimm & Katherine Chamberlain (Spitfire Strategies), Kim Huthinson (Disability Funders Network), Judith Katz (The Kaleel Jamison Consulting Group), Emily Lawson (D.C. Preparatory Academy), Malkia Lydia (Kuyamba), Katie McNerney (Endeavor Group), Caryn McTighe Musil (AAC&U), Pamela Meyer (Simpatico Networks), Denise Hamler (Co-op America), Darell Hammond & Kate Becker (KaBOOM! ), Kris Prendergast (Social Enterprise Alliance), Billy Shore & Nicole Hanrahan (Share Our Strength & Community Wealth Ventures), Wayne Silby (Calvert Social Funds), and various members of Social Venture Network. Tony Deifell is a visual artist and social entrepreneur. He has spent over a decade creating youth-generated media projects, including From the Hip, Youth Voice Radio, and ISM, which was recognized by the White House as a national model of diversity education, using video diaries to address race issues. He serves as Chief Strategist for KaBOOM!, serves on the board of directors of Active Voice, advises film and television projects, and continues to develop participatory media-making productions such as WDYDWYD? (Why Do You Do What You Do?). Tony was an artist-in-residence at the Headlands Center for the Arts, taught documentary studies at Duke University, and was a national leadership fellow with the W.K. Kellogg Foundation. He taught photography at Governor Morehead School for the Blind from 1992 to 1997.